Hobo spiders can be found primarily in southwestern Canada as well as in the northwestern states. They have even been discovered as far up as southern Alaska. Hobo spiders originated in Europe, where they can also still be found today. Other names for the hobo spider are black recluse spiders and funnel web spiders; despite the name, they are not actually recluses at all. Spiders like the hobo spider are poisonous to humans even though half of the time the venom does not cause any serious harm. With that said, do not take any risks; if bitten, see a doctor just to be safe. The poison that is injected when the hobo spider bites can cause a hole to form in one’s skin. Unsurprisingly, this is extremely painful. That is why it is imperative for homeowners living in areas with hobo spiders to protect themselves and their families from it. This article will outline a few simple steps below one can take to get rid of, or drastically reduce the chances of, hobo spiders in their home. Like many other creatures, hobo spiders generally do not enter people’s homes unless there is a source of food attracting them. Spiders prey on insects; therefore, killing the insects in your home will have the added benefit of detracting hobo spiders. If you notice any cobwebs, remove them as soon as possible. Hobo spiders tend to build their webs in the corners of homes. The places most likely to attract spiders are the attic, basement, and empty storage rooms. Since these rooms are not frequented enough, spiders often get away with living in your home for long periods of time and may even begin to lay eggs, causing an infestation. It is important to regularly clean your home so that this scenario will not occur. When vacuuming, do not forget to dispose of the receptacle bag promptly, or else the spider may simply crawl back out into your home. Destroy the spider webs outside of your home also. Use a stick for added reach if the webs are out of your reach. Step on the spiders to kill them; otherwise, they will simply rebuild their destroyed web. Of course, this step is much more effective if you cut off its food source, otherwise they will keep coming. There are many insect traps available, but purchase a trap specifically designed for black and brown recluse spiders. These traps work by using a scent that will attract the spiders to sticky glue that will trap them, eventually killing them. Place these traps in areas where you have seen spider webs. Examples of such areas are entryways, corners, and window wells. You can purchase hobo spider traps in most major chain stores, home improvement stores, or online. Sprinkle it around the perimeter of your house and in your yard. Diatomaceous earth is an effective, non-toxic method of killing hobo spiders, as well as other insects. The diatomaceous earth can pierce through the hobo spider’s exoskeleton. This doesn’t kill them outright; the punctured exoskeleton exposes their insides to air, causing them to rapidly die of dehydration. Diatomaceous earth can be bought from garden supply stores or online. Check to see if the label on the packaging says that it is effective on hobo spiders. Then follow the directions for proper application. If bitten by a hobo spider, seek medical attention immediately. Within thirty minutes of the bite, the area hardens and a red circle approximately 2 inches in diameter will appear. After 15 to 35 hours, that entire area will start to blister. 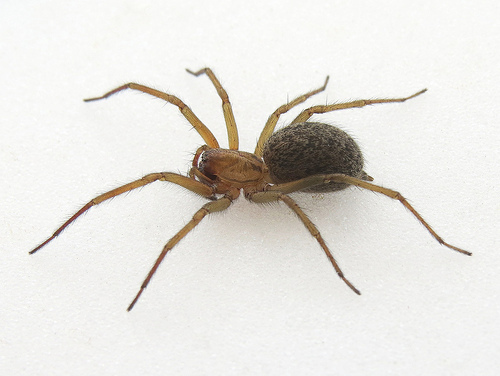 Victims have reported that they experienced dizziness and numbing sensations from hobo spider bites. The blisters tend to break after a 24 hour period, leaving you with a very painful, slowly healing wound. A large scar will be left even after healing. Watch the video below to see just how bad a hobo spider bite can get. Click here for more information on how to repel spiders naturally. Check out my article on how to learn how to repel camel spiders.